As promised, here are a few cell phone images I snapped at last night’s Democrat rally in front of CentralWorld mall, in the Rajaprasong area. None of these pics are photographic masterpieces, but they should convey a sense of what the scene looked like. The crowd, roughly mid-way back from the stage. 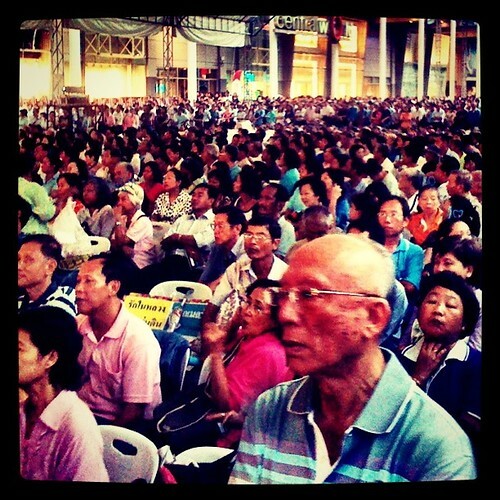 The crowd listening to Deputy PM Suthep. 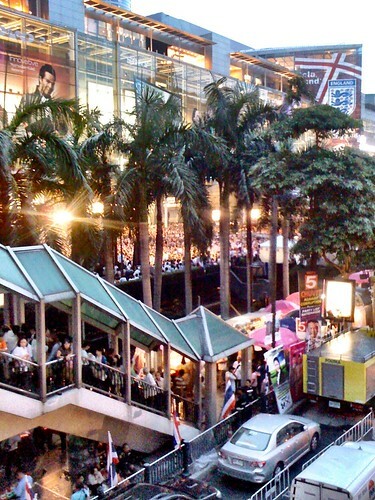 Another pic of the crowd, with CentralWorld behind. People assembled, seen in the background, behind the trees. Photo taken from BTS sky train walkway. 1. Dems rallying at rainy Rajaprasong. Suthep on stage showing pics and video from April 10 clashes. 2. Dems at Rajaprasong: Suthep showing map of red shirt camps and photo of shot soldiers and journos. 3. Several thousand people here. 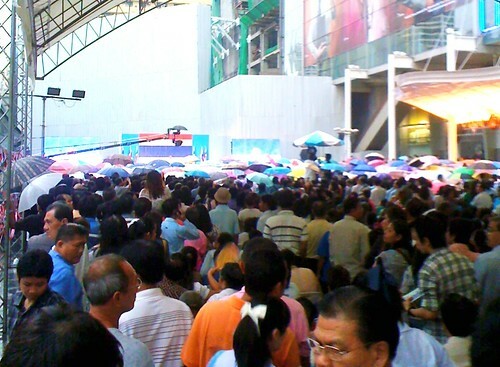 Abhisit signs, blue Democrat party flags, and lots of umbrellas. Also, snacks, of course. 4. No red shirts in sight. 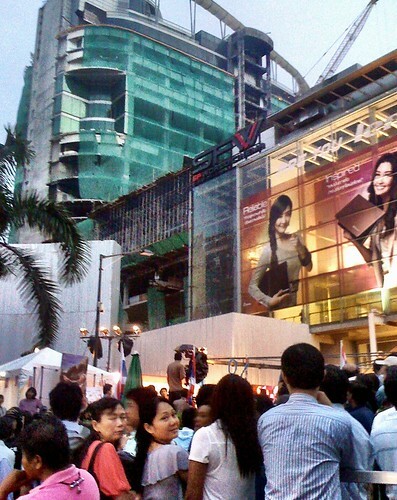 People packed into area under cover in front of CTW. Old portion of mall behind, still being repaired. Thailand’s prime minister rallied thousands of campaign supporters Thursday at the scene of last year’s deadly anti-government protests, defending his crackdown on demonstrators there as the best he could do under difficult circumstances. And here’s a Bangkok Post story about the rally, as well as an essay from The Nation‘s Pravit Rojanaphruk.